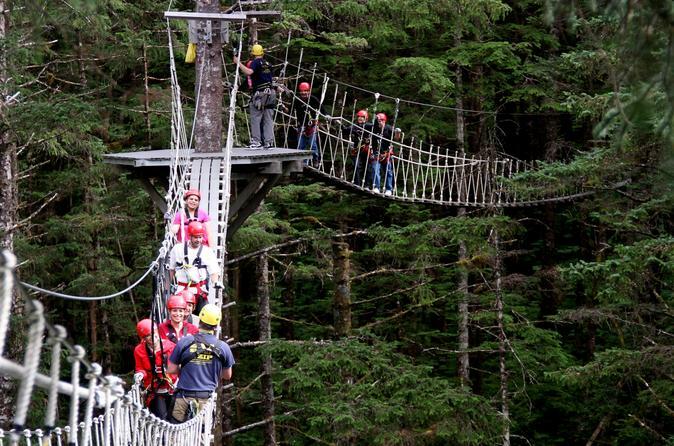 Spend your time in port in Ketchikan on an exhilarating zipline tour. During this shore excursion to Tongass National Forest, you'll soar above a dense canopy of trees at heights up to 135 feet (41 meters) in the air, cross three suspension bridges and look down on salmon-spawning streams and tidal estuaries. As you zoom across 6,000 feet (1,830 meters) of dual-cable ziplines, you’ll have the chance to spot wildlife like black bears and bald eagles. This advanced zipline course is limited to nine people per every two guides, providing a small-group experience. When your cruise ship docks in Ketchikan, you’ll be transported from the port to the zipline course at Herring Cove, an 8-mile (13-km) drive south of town along a scenic coastal road. Then hop aboard an all-terrain 4x4 Mercedes Unimog for the ride up a steep forest hill to the canopy chalet. Here, receive your harness, helmet, gloves and other state-of-the-art equipment, and listen to instructions and safety tips from your two professionally trained guides, who are present on all the platforms throughout the course to make sure you take off and land safely. Then it’s time to start your rainforest adventure — simply climb up to the first platform, and away you go. Across eight dual-cable ziplines, fly through the dense canopy of spruce, hemlock and cedar trees that make up Tongass National Forest. Between the starting zipline of just 100 feet (30 meters) in length to the adrenaline-pumping 850-foot (260-meter) ‘Ben’s Revenge’ line, you’ll zoom over salmon-spawning streams and tidal estuaries, and have the chance to see local Alaskan wildlife like bald eagles and black bears. The course also includes three suspension bridges and a nature trail so you can maximize your opportunities to see wildlife and natural features like Eagle Creek Falls. The last zipline takes you out of the rainforest and over a grassy wetland, where you’ll land at a 55-foot (17-meter) viewing tower. Take a moment to enjoy one last view of your lush surroundings, and then climb down the stairs to base camp to remove your equipment and receive a medal in recognition of your adventurous spirit. Refuel with a provided snack and hot beverage, and take a look at photos from the course in the General Store (available for purchase). Your shore excursion ends with the drive back to Ketchikan. Please note: Previous ziplining experience is not required, but be aware that this zipline course is designed for those who have done it in the past and/or are looking for a more challenging and exciting experience. Worry-free Shore Excursion: We will ensure your timely return to the Ketchikan port for this activity. In the rare event your ship has departed, we will arrange for transportation to the next port-of-call. If your ship is delayed and you are unable to attend this activity, your money will be refunded. See our terms and conditions for full details.